How I got a hold of this book: I bought it at a used bookstore in Tulsa. Why I read this book: I bought this book a couple of years ago and finally got around to reading it this summer. I bought it because it was one of Hemingway's books and because it's on just about every "You must read these books or else" list you come across. I couldn't say that there was much of an impetus to read it this summer other than I simply decided it was time to start reading. Rating: 5+ stars--I absolutely love this story! I’d even go so far as to say it’s a new favorite. I love the idea of traveling from site to site and being drunk almost the entire time, but still getting amazing opportunities and getting to see amazing things, but I’ll elaborate a bit on that. This was my fourth Hemingway and I'd say it's tied (with A Farewell to Arms) for favorite. There are so many wonderful things I'd like to say about this book. But I'll just go with the strongest feeling I had while reading it--I wanted to run away to Italy or France and become a foreign correspondent for an English language newspaper. I really liked how the main character, Jake Barnes, lived. Barnes and his friends traveled from France to Spain and to another couple of places. They were drunk pretty much the entire time, but they met a lot of new people and got to see and do some really cool things, like an awesome fishing trip or the bull fights. Barnes was running up against deadlines, kind of like I am right now with getting this review done. This is a storyline that I am just attracted to…it’s the same in The Rum Diary by Hunter S. Thompson and with Gregory Peck’s character in Roman Holiday. A lot has been said about Hemingway's treatment of his female characters. Of all of the Hemingway I've read, Lady Brett Ashley is my favorite of his females because she's not terribly passive. She's stronger and she has (and knows) her own mind. Some people might call her cruel or flighty, but I think she just wants to explore as much as she can and is willing to play situations and people to her advantage. 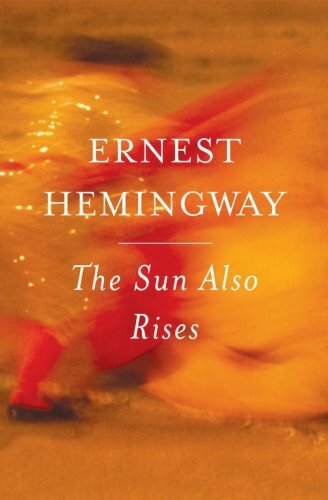 I think that this novel gives an excellent feel for Hemingway's infamous narrative style. The sentences were, for the most part, short and direct. They were blunt. They told you how to feel and what to think. And I appreciated that. This would be a really good novel to read if you've never read Hemingway before because, as already mentioned, it gives a good taste of his style and it's pretty short, so if you don't like, it's not like you've wasted too much time. I own this and definitely need to read it! I also loved this book! Awesome review! Great review! I read A Farewell to Arms this summer and I had a hard time with it, I think because I disliked that English nurse so much that I just couldn't get into the story. She was so passive and had a weak personality. I like Hemingways style though, for sure. I don't think I'll give up on him just yet. I read this book for a class on the Jazz Age and loved it, too. I like Hemingway quite a bit better than his fellow ex-pat F. Scott Fitzgerald, mainly because I like that short yet meaningful style. Also, his short stories are better. Great review, and I'm glad you enjoyed it, too. I really want to read this book! But for some reason I get intimidated by Hemingway.